Spring is the time to find out where you are, who you are, and move toward where you are going. Spring is my favorite time of the year. We are just coming out of a cold, dreary, time in our life. That is unless you live in a tropical climate. Then spring may be just a little warmer than it was yesterday, weather wise. But I often think of spring as when we need to reflect back on where we are, who we are and where we want to be. That’s why this quote hits home with me. Many do this reflection at the the beginning of the calendar year. In December and January, we start working on our goals for the coming year, defining what we want to be and work on by the end of the year. Me, I like thinking of spring as the beginning of a new cycle of life. That’s what nature does. The spring is the rebirth of the new life after the winter freezes. I find I can better get a feel for where I am in life and where I want to be when the spring comes. But that’s me. It doesn’t matter when you begin. The key is to begin, to start this process when it is best for you. Regardless of when you start, it also a good time to check in periodically on where you are, who you are and where you are going. If you started in December or January, working on your goals, take some time now, in the spring, to see if the fruits of your labor are starting to spring up? Are you who you wanted to be at this time of the year? Are you heading in the right direction to the destination you want to achieve? I’ve been working on one of my goals, to become a professional speaker. I have achieved that goal, in that I have presented and been paid to do a speech. I was honored to present at the International Facility Management Association, San Francisco Chapter’s Annual Kickoff Meeting. 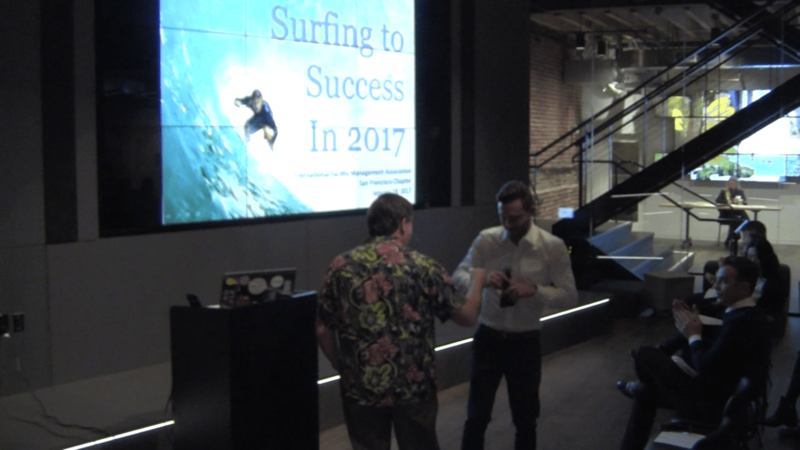 I presented my Surfing to Success in 2017 keynote address before a large crowd in January. It was a great time with a fantastic group of facility management professionals. I was thrilled to be able to share my program about how to achieve success by using your passion for what you do, or want to do, to propel you to success and going out each day and catching your next big wave and being successful in the years to come. I am continuing to build my speaking business and will graduate from the National Speakers Association of Northern California Speakers Academy in May. I joined the National Speakers Association as well and am continuing to learn more about the speaking business and marketing to grow my speaking business. Spring has sprung as they say, and I am looking at where I am now, who I am and where I want to go. How about you? Are you where you want to be? Are you who you are? Are you heading in the direction you need to go? If you are, share what successes you have had this spring. Go to the Comments and tell the Goal Getters what you are doing and the success you have this spring. Where are you going the rest of the year? We want to hear from you. If not, don’t worry. Start now, it’s spring. It’s time for new growth. I am happy to help you with your planning of and the execution of your goals. We all sometimes need an accountability partner to keep us on track. I offer personal and group coaching services to help you get the goals you set. Check out my Coaching Page at GoalGettingPodcast.com/Services to see the plans I offer and select the best one for you. If you would like to book me for a speaking engagement, please check out the programs I offer on my Speaking Page at GoalGettingPodcast.com/Speaking to find out more. You can see my speaker one-sheet there. Spring is a time to find out where you are, who you are, and move toward where you are going. 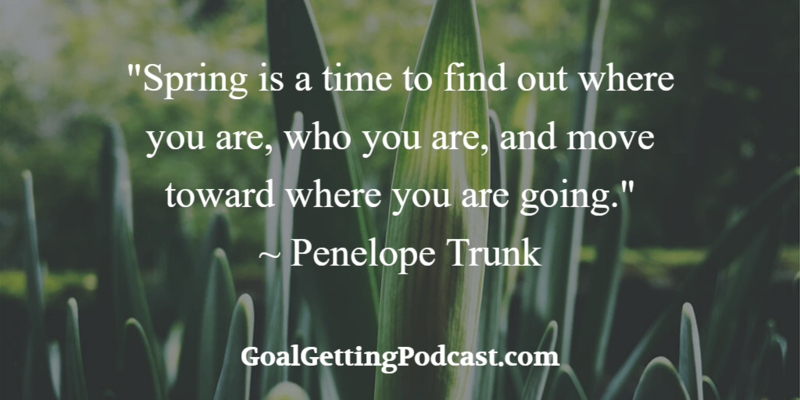 Thank you Penelope Trunk for that great quote.